A brace from Edgar and a goal from Kim Dae-won saw AFC Champions League debutants Daegu FC stun two-time winners Guangzhou Evergrande 3-1 in Tuesday's Group F Matchday Two clash at the Forest Arena. Buoyed by a maiden Continental win away at Melbourne Victory by the same scoreline on Matchday One, the hosts were on top for the opening spell in their AFC Champions League home debut against the Chinese heavyweights. Brazilian striker Edgar ensured that the Koreans' early dominance was converted into tangible reward, delighting the Daegu faithful on 24 minutes after he stretched out a long right leg to volley Kim Dae-won's ball over the top past goalkeeper Zeng Cheng. And the former Buriram United man sent the home crowd into the half-time break on an even greater high as Cesinha picked out his countryman with a fine through ball and Edgar slotted home clinically two minutes before the interval. Guangzhou coach Fabio Cannavaro made changes after the break in an attempt to get back on level terms, and one of those substitutes, Wei Shihao, helped reduce arrears with a fine cross from the right that Anderson Talisca turned in on 53 minutes. Zeng Cheng prevented Daegu from restoring their two-goal cushion with a smart save from Jeong Seung-won's shot after he cut in from the right with 11 minutes remaining, before Kim Dae-won then saw his own effort from the opposite flank fizz narrowly wide of the far corner. But in a near carbon copy of his earlier chance mere minutes earlier, Kim Dae-won did then make it 3-1 to the hosts after he again cut in from the left and this time his shot went across Zeng Cheng to find the net. 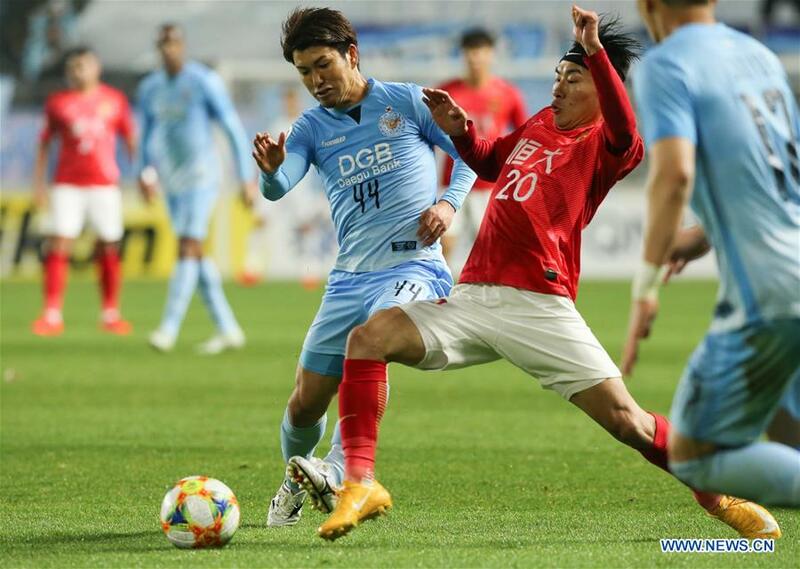 The result saw an end to Guangzhou's unbeaten run in the AFC Champions League Group Stage that totaled 15 matches and stretched back to April 2016, and positions Daegu FC as early frontrunners in Group F with two wins from two. Sanfrecce Hiroshima, who defeated Melbourne Victory earlier on Tuesday, are Daegu FC's next opponents in Japan on April 10, while Guangzhou will look to bounce back against Melbourne on home turf.